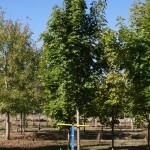 A fast growing, oval tree with dark green, glossy foliage. The leaves are reddish when they emerge in the spring; fall color is bright yellow. A strong grower, with a densely branched crown. Tolerant of a wide range of soils, heat and drought. Performs best in full sun. Selected in 1959 in Oregon.